Electric Furnaces (also called Air Handlers and Fan Coils) are large blower units that have a specific size electric heating strip installed on the outlet side of the system. Like a large hair dryer, when the unit runs, air is forced across the heated coil, blowing hot air into the home. They may be matched to a heat pump system, or installed as the heating portion of a central air conditioner. Electric furnaces are commonly found in all types of homes throughout country, however, they are primarily used where winters are not as harsh and demanding on the home heating system. Electric furnaces are very high efficiency since every dollar you spend on fuel (electricity) is converted to heat into your home. However, that does not mean you’ll save money, since an electric furnace uses quite a lot of electricity to heat your home, and are usually expensive to operate. 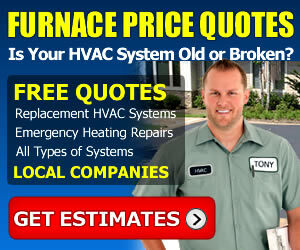 On this page of the Furnace Price Guides, we’ll compare the cost of electric furnaces. First, we’ll list electric furnace prices sorted by the different brands in the market, as well as review variables such as furnace size and heating strip options. Along with manufacturers and sizes, we’ll explore the cost of repairing an electric furnace. Finally, near the bottom of the page, you’ll find user submitted prices for the electric furnaces installed in their own homes. Updated January 2019 | Added new 2018 and 2019 electric furnace pricing, repair and installation cost, as well as updated visitor installed pricing with and/or without a full central ac system. Just like gas and oil furnaces, the brand of electric furnace you choose to have installed, will play a major role in the price. In fact, for electric furnaces, brand is probably the biggest price factor. Top rated brands like Carrier and Trane are simply more expensive than average brands like Goodman. The higher cost brands usually attract better qualified or well established hvac contractors as well, so the cost of installation for an electric furnace may be slightly higher on top rated brands as well. For this example, we’ll use a 3 ton (1200 cfm blower) electric furnace with a 5kw (Approx 17,000 btu) electric heat strip. This would be a typical setup in a 1500 sf home in the Southeast USA, where the temps rarely drop below freezing. The only accurate way to determine the size needed for your home is to consult a professional, and have heat loss calculations factored into your specific home. Electric furnaces, just like gas furnaces and oil furnaces, need to be properly sized to your home. If you are using the system for heat only, the fan coil needs to be sized to heat the specific areas of your home its being installed to. If you are using the air handler as part of your central cooling or air conditioning, the blower in the unit also needs to be matched to the capacity of your condensing unit. When it comes to electric furnace sizes, the biggest variables that affect the cost are the size of the unit air handler, and the type of blower. 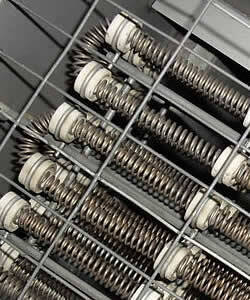 Additional components like a factory installed coil (for cooling) will also have an effect on the overall cost. The correct way to ensure you have a properly sized electric furnace is to perform a heat loss calculation on your home or area, and determine the correct btu range needed to maintain the temperature. There are DIY load calculators online, or you can request that your heating and air contractor perform the manual J calculations at the time of your replacement estimate. For the purpose of the prices below, we are using an average quality brand name air handler, installed to a first floor (average difficulty) utility closet. The unit would also have a matching evaporator coil installed for a heat pump or air conditioner. Unlike gas or oil furnaces, an electric furnace has much fewer parts that break down, and as you may guess, they are mostly electric. Although there are few parts, diagnosing and repairing an electric furnace is still a job for a professional HVAC technician. Working around electricity is dangerous, and you will need specialized tools to test the various components inside an air handler. Additionally, if the unit has a built-in coil, as most do now, you will have to deal with refrigerants as well. Many repair companies base the pricing on flat rate prices, however some still use a parts + labor pricing model. If you prefer one over the other, you should ask on the phone which model the company uses. Take note that if your electric furnace or attached cooling system is more than 8 years old, or if the technician suggest an electric furnace repair cost that’s more than 30% of the replacement costs listed above, you always ask for a complete replacement option, and always get a second opinion. most companies offer free second opinion estimates. The partners in our own system offer free estimates for repair or replacement. 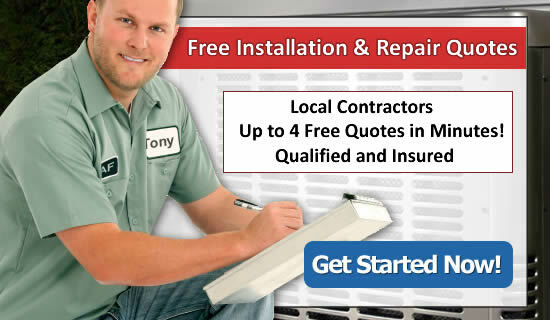 Click here If you would like free estimates from qualified local contractors in your area. Regardless of how complete we feel our information is, we always understand it could be better! To that end, we ask readers like yourself to submit your own experience with electric furnace pricing, and share what you paid or were quoted for your last replacement, repair or complete system that included an electric furnace, air handler or fan coil system. Your personal information is never shared on our website, and we’ll say thank you for the future visitors in advance. Thank you! Had an old miller electric furnace and heat pump in our mobile home. Replaced it with a new Rheem system. Replacement Details – Got real cold and the heater quit working. Repair was almost $1200, so we went for the new electric furnace instead. He also left the new ac coils inside of it for when we have to replace the air con also. It was $750 for an electric furnace blower repair or $2400 for a whole new system with a new built in coil. 2 guys, 1 day. Details – The blower and fan coil in our heat pump system stopped working. Instead of a complete new system we chose to replace just the blower assembly and electric coils in our electric furnace. The heat pump system in our home quit working. Replaced it with a Coleman electric furnace and heat strips, and a Coleman outside heat pump. Our heat pump system quit on Weds, the company had a new Goodman heat pump put in the next day. Heat pump installed prices was $6500 and included the outside heat pump condenser, electric furnace with heat strips, installation. Took three guys about 5 hours to get the whole thing done. We financed the job. Everything stopped working on our hvacs, no heat, no air, nothing. The house is 35 years old and the old hvacs looked like it was here that long too. We had the guys replace the whole thing with a trane electric furnace and air conditioner. Took 2 guys 1 full day to get it working again, but it feels great now! The heat pump in our mobile home quit. New 2-ton Carrier heat pump with electric furnace was $3,900 installed.